American airline Northwest Airlines is merged into Delta Air Lines. Boeing 727-231F 9Q-CAA of Congolese airline Compagnie Africaine d'Aviation was substantially damaged when it departed the side of the runway at N'djili Airport, Kinshasha. The aircraft was later reported as damaged beyond repair. In Slovakia, a package containing the explosive RDX was placed in the luggage of a passenger at Poprad-Tatry Airport by Serbian police as part of a training exercise. Due to an error, the package was not recovered and the luggage was loaded onto a Danube Wings flight to Dublin. The error was not realised until the plane had departed. The Garda Sx�ochx�na were not informed until 5 January, causing a bomb alert in Dublin. The innocent passenger was arrested but later released when the Slovak Government admitted he was blameless. Air Berlin Flight 2450, operated by Boeing 737-800 D-ABKF overran the end of the runway after an aborted take-off at high speed due to an airspeed discrepancy on the two pilots' instruments. The incident happened at Dortmund Airport. There were no injuries among the 171 people on board. United Airlines Flight 634, operated by Airbus A319-131 N816UA made an emergency landing at Newark Liberty International Airport when the right main landing gear failed to deploy. The aircraft sustained some damage when the right engine contacted the runway. The 53 passengers and crew evacuated the aircraft via the emergency chutes without injury. Initial fears that the wing had been damaged in the accident later proved groundless, with damage being confined to the engine and nacelle. German airline Blue Wings ceased operations. Iran Air Fokker 100 EP-IDA, operating Flight 223 was substantially damaged when the nose gear collapsed after landing at Isfahan International Airport. UTair Aviation Boeing 737-500 VQ-BAC departed the runway on landing at Vnukovo International Airport and was substantially damaged when the nosewheel collapsed. Japanese flag carrier Japan Airlines files for protection from bankruptcy. BinAir Swearingen SA-227-C Metro D-CKPP was damaged when the right main undercarriage collapsed on landing at Stuttgart Airport. PSA Airlines Canadair CRJ-200 N246PS overran the runway at Yeager Airport, Charleston, West Virginia following a rejected take-off. The aircraft was stopped by the EMAS at the end of the runway, sustaining substantial damage to its undercarriage. Cargolux Flight 7933, operated by Boeing 747-400 LX-OCV struck a vehicle on landing at Luxembourg International Airport. The van suffered major damage and the aircraft sustained a damaged tyre. Three investigations have been launched into the incident. Taban Air Flight 6437 crashed on landing at Mashhad International Airport Iran. All 170 people on board escape from the burning aircraft. Ethiopian Airlines Flight 409 crashed into the Mediterranean shortly after take-off from Beirut Rafic Hariri International Airport for Bole International Airport, Addis Ababa. Spanish airline Quantum Air ceased operations. Guicango Yakovlev Yak-40 D2-FES suffered the collapse of all landing gears on landing at Quatro de Fevereiro Airport, Luanda, Angola on a flight from Cabinda. Yakutia Airlines Flight 425, operated by Antonov An-24 RA-47360 suffered an engine failure on take-off from Yakutsk Airport for Olekminsk Airport. During the subsequent landing, the nose and port main undercarriage were retracted, causing substantial damage to the aircraft. Trigana Air Service Flight 168, operated by ATR-42-300F PK-YRP made a forced landing in a paddy field at Bone, Indonesia. Two people were seriously injured and the aircraft was written off. Click Mexicana Flight 7222, operated by Fokker 100 XA-SHJ suffered an undercarriage malfunction on approach to Quetzalcx�atl International Airport, Nuevo Laredo. A low fly-past confirmed that both main gears had not deployed. The aircraft diverted to General Mariano Escobedo International Airport, Monterrey, where it was substantially damaged in the landing, having departed the runway and spun through 180�. Spanish airline Hola Airlines ceases operations. ACT Airlines Airbus A300B4-200 TC-ACB sustained substantial damage when the port undercarriage collapsed on landing at Bagram Air Base, Afghanistan. The port engine and wing were also damaged. Air Tanzania Flight 100, operated by Boeing 737-200 5H-MVZ sustained substantial damage when it departed the runway on landing at Mwanza Airport and the nosewheel collapsed. Damage was also caused to an engine. Exin Flight 3589, operated by Antonov An-26 SP-FDO received an unsafe gear warning on approach to Lennart Meri Tallinn Airport, Tallinn, Estonia on a flight from Helsinki Airport, Helsinki, Finland. A go-around was initiated, during which an engine failed and a wheels-up landing was made on the frozen surface of Lake x�lemiste. Two of the six crew were injured. Aviastar-TU Flight 1906, operated by Tupolev Tu-204 RA-64011 crashed on approach to Domodedovo International Airport, Moscow. The aircraft was written off, the first hull loss for Aviastar and the first of a Tu-204. Scottish airline Highland Airways ceases operations. A Polish Air Force Tupolev Tu-154M carrying the Polish President Lech Kaczyński and many other Polish officials crashed on approach to Smolensk, Russia. Jamaican airline Air Jamaica ceased operations. All services taken over by Caribbean Airlines. Merpati Nusantara Airlines Flight 836 operated by Boeing 737-300 PK-MDF overran the runway at Rendani Airport, Manokwari, Indonesia. All 103 passengers and crew escape alive. Aerounion - Aerotransporte de Carga Union Flight 302 operated by Airbus A300B4F XA-TUE crashed on approach to General Mariano Escobedo International Airport, Monterrey, Mexico. All five crew were killed, as was one person in a car that was hit by the crashing aircraft. Following the second eruption of Eyjafjallajx�kull in Iceland, large areas of controlled airspace were closed, causing widespread suspension of services across Europe. Pacific East Asia Cargo Airlines Flight 7815, operated by Antonov An-12 UR-AN216 crashed on approach to Diosdado Macapagal International Airport, Philippines after a fire broke out in flight. Three of the six crew were killed. Afriqiyah Airways Flight 771 operated by Airbus A330-202 5A-ONG crashed on approach to Tripoli International Airport, Libya, killing 103 people. A Blue Wing Airlines Antonov An-28 crashed shortly after take-off from Godo Holo Airstrip killing all eight on board. Pamir Airways Flight 112, operated by Antonov An-24 YA-PIS crashed in the Salang Pass killing all 43 on board. Air India Express Flight 812, operated by Boeing 737-800 VT-AXV crashed at Mangalore International Airport with the loss of 162 lives. Trans States Airlines Flight 8050, operated by Embraer ERJ-145 N847HK overran the runway at Ottawa Macdonald-Cartier International Airport and was substantially damaged when the nose gear collapsed. Berlin Air Services Douglas DC-3 D-CXXX crashed shortly after take-off from Berlin Schx�nefeld Airport on a local sightseeing flight. Eight people were injured and the aircraft was substantially damaged. The Solar Impulse I HB-SIA makes a circumnavigation of the planet, the first by a solar powered aircraft. The flight also set records for length of flight and altitude for solar powered aircraft. The Boeing 787 airliner makes its first international appearance at the Farnborough Airshow, UK. An Israeli Air Force (IAF) Sikorsky CH-53 Sea Stallion helicopter crashes during a joint Israeli-Romanian aviation exercise in the Carpathian Mountains in northern Romania, killing six IAF officers and one Romanian Air Force officer. Airblue Flight 202, operated with an Airbus A321, crashes in the Margalla Hills near Islamabad. Boeing C-17 Globemaster III 00-0173 of the United States Air Force crashed near Elmendorf Air Force Base killing all four people on board. All West Freight Fairchild C-123 Provider N7099R crashes at Mount Healy, Alaska killing all three crew. Todd Reichert of the University of Toronto Institute for Aerospace Studies pilots a human-powered ornithopter, Snowbird, in Ontario, sustaining 19.3 seconds of flight, covering a distance of 145 metres (475 ft). The 42.6 kg (92.59 lb) craft has 32 metre-span flapping wings. Katekavia Flight 9357 crashes in Igarka, Russia, killing eleven people. 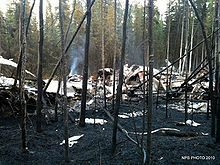 A de Havilland Canada DHC-3T Turbo Otter crashes near Aleknagik, United States killing former Senator Ted Stevens. Former NASA Administrator and current EADS North America CEO Sean O'Keefe is amongst the survivors. Regional spanish airline Andalus Lineas Aereas ceases operations. AIRES Flight 8250, operated by Boeing 737-73V HK-4682, crashes short of the runway at Gustavo Rojas Pinilla International Airport, San Andr�s, Colombia and breaks into three sections. One passenger dies from a heart attack following the accident. The other 124 passengers and six crew survive. Saudi Arabian airline SAMA ceases operations. Agni Air Flight 101 crashes near Shikharpur, Nepal killing all 14 people on board. Henan Airlines Flight 8387 overruns the runway on landing at Lindu Airport, China. 42 of the 96 people on board were killed. Filair Let L-410 Turbolet 9Q-CCN crashes short of the runway at Bandundu Airport, killing all 14 people on board. Passaredo Transportes A�reos Flight 2231, operated by Embraer E-145 PR-PSJ, lands short of the runway at Vitx�ria da Conquista Airport and is substantially damaged but all 27 people on board survive. Iran Aseman Airlines Flight 773, operated by a Fokker 100, overruns the runway on landing at Tabriz International Airport. The aircraft is substantially damaged. UPS Flight 6, operated by Boeing 747-44AF N571UP crashed shortly after take-off from Dubai International Airport, killing both crew and destroying the aircraft. N571UP was operating an international cargo flight to Cologne Bonn Airport, Germany. A Fletcher FU24 crashed on take-off from the Fox Glacier, killing all nine people on board. This was the worst aircraft accident in New Zealand for 21 years, and at the time the 7th worst in New Zealand. Alrosa Mirny Air Enterprise Flight 514, operated by Tupolev Tu-154M RA-85684 suffered a complete electrical failure in flight. A successful emergency landing was made at Izhma Airport, Russia but the aircraft overran the runway. All 81 passengers and crew escaped uninjured. Conviasa Flight 2350, operated by ATR 42-400 YV-1010 crashed shortly after take-off from Manuel Carlos Piar Guayana Airport, Ciudad Guayana, Venezuela on a domestic scheduled passenger flight to Del Caribe "Santiago Marix�o" International Airport, Porlamar, Isla Margarita. The aircraft was carrying 47 passengers and crew. Initial reports suggest 24 survivors. DHC-8-103B LN-WIF of Widerx�es Flyveselskap was substantially damaged in a hard landing at Sandnessjx�en Airport, Stokka when the undercarriage collapsed. The aircraft was operating a domestic scheduled passenger flight from Bodx� Airport. Wind Jet Flight 243, operated by Airbus A319-132 EI-EDM, landed short of the runway at Punta Raisi Airport, Palermo, Italy after encountering a thunderstorm and windshear on approach. The aircraft was substantially damaged when it impacted the localiser. Both main undercarriage sets collapsed and the aircraft was evacuated by the emergency slides. Around 20 passengers were injured in the evacuation. PIA Flight 782, carrying 273 people bound from Toronto Pearson International Airport for Karachi, landed at Stockholm's Arlanda Airport on September 2010 because of a hoax bomb threat on board. After evacuating the passengers from the plane, a thorough check was made to find any explosives, if present, on the aircraft. Police operation leader Stephan Radman said later that no explosives were found on board. The airplane left to Manchester Airport at 5 pm local time to continue its journey to Karachi because the crew was too tired to complete the flight to Pakistan. This aircraft is operated by Boeing 777. Transafrik International Flight 662, operated by Lockheed L-100 Hercules 5X-TUC crashed into a mountain 19 miles (31 km) east of Kabul International Airport, Afghanistan, killing all eight crew. A Eurocopter AS350 helicopter crashed in Antarctica, killing four people. A terrorist plot to send bombs by air freight from Yemen to the United States via the United Kingdom is uncovered. Qantas Flight 32, operated by Airbus A380 VH-OTA suffered an uncontained engine failure over Batam Island, Indonesia. Falling debris injured one person on the ground. The aircraft dumped fuel and returned to Singapore Changi Airport, where a safe landing was made. Aero Caribbean Flight 883, operated by an ATR 72 crashed at Guasimal, Sancti Spx�ritus, Cuba killing all 68 people on board. A Jahangir Siddiqui Air Beechcraft 1900 crashed near Karachi, Pakistan, killing all 21 people on board. An Israeli Air Force F-16I crashes in Makhtesh Ramon while on a training over the Negev desert in southern Israel, killing both the pilot and navigator of the plane. Sun Way Flight 4412, operated by Ilyushin Il-76 4L-GNI on a cargo flight crashed in a populated area of Karachi, Pakistan, shortly after taking off from Jinnah International Airport. All eight people on board were killed, as were a further two people on the ground. The aircraft was reported to have been trying to return to Jinnah after suffering an engine fire. South East Airlines Flight 372, operated by Tupolev Tu-154M RA-85744 crashed on landing at Domodedovo International Airport, Moscow, Russia. Of the 168 people on board, two passengers were killed. The aircraft was written off. A Tara Air flight operated by DHC-6 Twin Otter 9N-AFX crashed into a mountain shortly after departure from Lamidanda Airport, Nepal. The aircraft was operating a chartered passenger flight to Tribhuvan International Airport, Kathmandu, Nepal. All 19 passengers and crew were killed. Last operation by a Harrier Jump Jet, from RAF Cottesmore. Antonov An-22 RA-09343 of the Russian Air Force crashed at Krasny Oktaybr, Russia killing all twelve crew. The aircraft was on a positioning flight from Voronezh Airport to Tver-Migalovo Airport. First flight of the Sukhoi T-50 in Russia. First flight of the Boeing 747-8 in the United States.